Do not format SDXC cards in SD/SDHC host products otherwise card will no longer be SDXC format. We cannot be responsible for incompatibility issues. 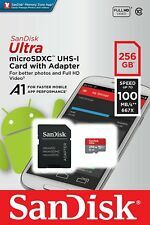 Get more out of your Android-based smartphone or tablet with the SanDisk Ultra microSDXC UHS-I Card. Condition is New. Our cards are 256gb U3 SDXC. 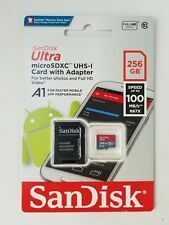 FREE MICRO SD TO USB ADAPTER. these parts are given to computer manufacturers in bulk to lower costs por computer parts. Fulfill your need for speed Record and play 4K UHD video. With ultra-fast read & write speeds up to 100MB/s & 90MB/s respectively, the 256GB EVO Plus lets you transfer a 3GB video to your notebook injust 38 seconds. Trending at $52.90eBay determines this price through a machine learned model of the product's sale prices within the last 90 days. Item ID: S56948. WORKING CONDITION. Up to 100MB/s & 90MB/s read & write speeds respectively; Class 10 UHS-1. NO OTHER PARTS OR ACCESSORIES INCLUDED. Storage Capacity: 256GB. Water Proof, Magnet Proof. Product Manufacturer: Samsung. Product Type: Micro SDXC UHS-1. Manufacturer Part Number: MB-MC256G/PAC. 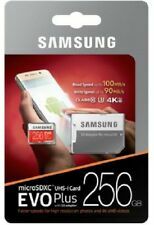 Samsung 256GB Micro SD SDXC MicroSD MicroSDXC Class 10 100MB/s 256 G GB EVO Plus. Condition is New. Shipped with USPS First Class Package. Storage Capacity: 256GB. Micro SD (SDHC and SDXC). SD (SDHC and SDXC). Mini SD (SDHC and SDXC). Product Manufacturer: SanDisk. 1 x Standard SanDisk SD Adapter. Product Type: MicroSDXC. Manufacturer Part Number: SDSQXA1-256G. Trending at $68.99eBay determines this price through a machine learned model of the product's sale prices within the last 90 days. Up to 100 MB/s Read speed. Storage Capacity: 256GB. Micro SD (SDHC and SDXC). SD (SDHC and SDXC). Mini SD (SDHC and SDXC). Product Manufacturer: SanDisk. 1 x Standard SanDisk SD Adapter. Product Type: MicroSDXC. Manufacturer Part Number: SDSQXCZ-256G. Samsung EVO Select 250GB, Class 10 90MB/s - microSDXC Card - MB-ME256GA/AM. Condition is New. Shipped with USPS First Class Package. Trending at $50.80eBay determines this price through a machine learned model of the product's sale prices within the last 90 days. This is a new, unused product with no signs of wear. iPhone 8 Cases. Phone Batteries. 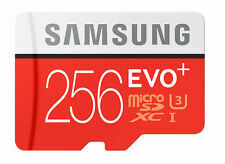 256GB Samsung EVO Plus Class UHS3 Micro SDXC Card. Includes Card Adapter and Case. Will include card only. Mfr Part #: TS256GUSD300SA. Transcend's microSDXC/SDHC 300S cards are the right choice! Random read/write performance is thus crucial. The Application Performance Class was introduced to adapt this new trend.
) 2019-04-03. Great product, would buy again p p ( 171. Trending at $68.98eBay determines this price through a machine learned model of the product's sale prices within the last 90 days. 256GB Capacity. Compatible with all microSDXC and wide range of Full-Size SD applications. Record and play 4K UHD video. With ultra-fast read & write speeds up to 100MB/s & 90MB/s respectively, the Samsung 256GB EVO Select lets you transfer a 3GB video to your notebook in just 38 seconds. Compatible with most devices that support microSDXC cards. Includes microSDXC to SD adapter. 256GB storage capacity. Allows you to use this card with SD adapter slots. Compatible with all microSDXC and wide range of Full-Size SD applications. Plus, it's A2-rated, so you can get fast application performance for an exceptional smartphone experience. 4K UHD-ready with UHS Speed Class 3 (U3) and Video Speed Class 30 (V30). Rated A2 for faster loading and in-app performance. Ideal for android-based smartphones and tablets. Compatibility- Compatible with microSDHC and microSDXC supporting host devices. Size: 256GB. Premium transfer speeds of up to 100MB/s. Release Date: 2018-08-01. Samsung EVO Plus 256GB, microSDXC Card with SD Adapter. Condition is New. Shipped with USPS First Class Package. Capacity: 256GB. Type: microSDXC. You can reach us at. (not OEM, not Bulk). Model: MB-MC256GA/AM. 10 Year Warranty. 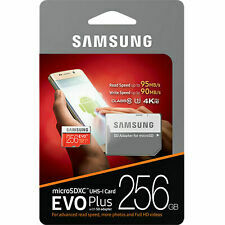 Samsung EVO Plus 256GB MicroSDXC with SD Adapter (MB-MC256GA/EU). Condition is New. Shipped with USPS First Class Package. 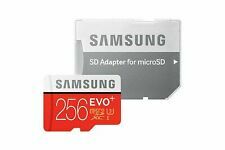 2018 SAMSUNG 256GB EVO Plus MicroSD Class10 U3 4K with SD Adapter. Capture life at its fullest with the breakthrough capacity of this 256GB microSD™ card. Built to perform in harsh conditions, SanDisk Ultra microSDXC UHS-I cards are waterproof, temperature-proof, shockproof, and X-ray proof. • Compatible with most devices that support microSDXC cards. • Includes microSDXC to SD adapter. • Card Type: microSDXC. • MicroSDXC to SD adapter. 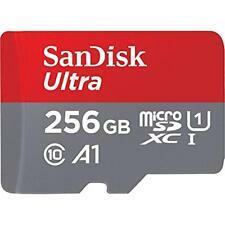 • 256GB storage capacity. • Sequential Write Speed: 90 MB/s. Plus, it’s A2-rated, so you can get fast application performance for an exceptional smartphone experience. Check with your device manufacturer for more details. | For 128GB-400GB: Up to 160MB/s read speeds, engineered with proprietary technology to reach speeds beyond UHS-I 104MB/s, requires compatible devices capable of reaching such speeds.